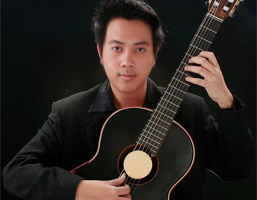 Classical guitarist and composer Nutavut Ratanakarn (Thailand) has been giving concerts, and master classes in Austria, Bhutan, China, Croatia, Denmark, England, France, Germany, Hongkong, India, Italy, Indonesia, Israel, Japan, Korea, Liechtenstein, Malaysia, Mexico, Russia, Spain Sweden, Taiwan and Thailand. He given concert , masterclass and jury member of many international guitar festival, including Moisycos International Guitar Festival (Italy), Kasetsart Guitar Festival, Bangkok International Guitar Festival ,Thailand International Guitar Festival, Magnitogorsk Festival( Russia),Guitar Gems International Classical Guitar Festival & Competition(Israel),CGS International Guitar Festival (Malaysia), KTJ Youth International Guitar Festival (Malaysia). Festival Internacional y Concurso Nacional de Guitarra “Ramon Noble”(Mexico) Calcutta International Guitar Festival (India) Bhutan International Guitar Festival, Guitar and Sea Festival (Croatia), Mario Egido international Guitar Festival (Spain) Pescara Music Festival (Italy), Festival Internationazionale della dell Orfento (Italy), John Durate International Guitar Festival (Austria) Nordhorn Guitar Festival (Germany), Burapha Guitar Festival(Thailand) Yogyakata International Guitar Festival, Nuite Musicales de Ciex (France) Changsha international Guitar Festival (China) Hongkong International Guitar Festival (Hongkong) ,Kirov International Guitar Festival (Russia) ,Jakata International Guitar Festival (Indonesia), Shenzhen International Guitar Festival(China), Daejon International Guitar Festival (Korea) Tarrega International Guitar Festival (Malaysia) Lahontan International Guitar Festival (France), Festival international de Musica Villa naval de san juan (Spain), Varelio International Guitar Festival ( Indonesia) and Hanoi International Guitar Festival (Vietnam) .He is currently the director of Bangkok International Guitar Festival, Thailand International Guitar Festival and president of Bangkok Guitar Society. He was a prize winner in Thailand International Guitar Competition 2003, Thailand Classical Guitar Competition1999 , and Thailand Yamaha Competition 1998 and1999. He has 9 records, “the Art of Spain”, “Guitar Recital”, “The Rhythm of Love’ audio CD, “Live concert inKorea” DVD Video by Alma Guitar,”Mai Thai Hi-run” Guitar with maithai chamber orchestra “Sakchai & Friend” Guitar with another instruments .”Benard A.Aaron music” , Inspiration and Anheri Raat all his compositions. He graduated with first-class honor from Kasetsart University majoring inClassical Guitar Performance. He participated in master classes with Alvaro Pierri, Eduarado Fernandez, Costas Cotsiolis, Paulo Bellinati, Pavel Steidl, Konrad Ragossnig, William Bower, Phillipe Villa, Jorgos Panetsos, Alessio Monti, Jury Clormann, Gareth Koch, Tomas Offermann, and Jozef Zsapka. He began his formal guitar lesson at 17. His principle teachers are Santi Sequerkawe,Tawee Maneecharuthat, Vidhaya Vosbein and Kamol Adshariyasart. His compositional output is now more than 70 pieces for solo guitar, guitar ensemble, piano, and string ensemble in a variety of styles. He has been interviewed in many magazines, Radio and Television in Thailand such as 3 ,5 ,7, 9 , TPBS and H-Plus Chanel 96.5 & 93.0 Radio, See-san, U-magazine, Kwan Leun, DDT and I-Am Magazine.